Let’s have a taste of mindfulness.1 Take an apple... Before taking a bite, pause for a moment. Look at the apple in your palm and [silently] ask yourself: When I eat an apple, am I really enjoying eating it? Or am I so preoccupied with other thoughts that I miss the delights that the apple offers me? The first thing is to give your undivided attention to eating the apple. When you eat the apple, just concentrate on eating the apple. Don't think of anything else. And most important, be still... Don't eat it while you are walking. Don't eat it while you are reading. Just be still. Being focused and slowing down will allow you to truly savor all the qualities the apple offers: its sweetness, aroma, freshness, juiciness, and crispness. Next, pick up the apple from the palm of your hand and take a moment to look at it again. Breathe in and out a few times consciously to help yourself focus and become more in touch with how you feel about the apple. Most of the time, we barely look at the apple we are eating. We grab it, take a bite, chew it quickly, and then swallow. This time, take note: What kind of apple is it? What color is it? How does it feel in your hand, What does it smell like? Going through these thoughts, you will begin to realize that the apple is not simply a quick snack to quiet a grumbling stomach. It is something more complex, something part of a greater whole. Then, give the apple a smile and, slowly, take a bite, and chew it. Be aware of your in-breath and out-breath a few times to help yourself concentrate solely on eating the apple; what it feels like in your mouth; what it taste like; what's it like to chew and swallow it. There's nothing else going your mind as you chew - no projects, no deadlines, no worries, no to-do list, no fears, no sorrow, no anger, no past, and no future. There is just the apple. When you chew, know that you are chewing. Chew slowly and completely, twenty to thirty times for each bite. Chew consciously, savoring the taste of the apple and its nourishment, immersing yourself in the experience 100 percent. This way, you really appreciate the apple as it is. And as you become fully aware of eating the apple, you also become fully aware of the present moment. You become fully engaged in here and now. Living in the moment, you can really receive what the apple offers you, and you become more alive. By eating the apple this way, truly savoring it, you have a taste of mindfulness, the state of awareness that comes from being fully immersed in the present moment. Letting go for those few short minutes and living in the here and now, you can begin to sense the pleasure and freedom from anxiety that a life lived in mindfulness can offer. In today's world, mindless eating and mindless living are all too-common. We are propelled by the fast pace of high-tech living– high-speed Internet, emails, instant messages, and cell phones– and the expectation that we are always on call, always ready to respond instantly to any message we get. Thirty years ago, hardly anyone would have expected to receive a reply to a phone call or letter within the same day. Yet today, the pace of our lives is utterly harried and spinning out of control. We constantly have to respond to external stimuli and demands. We have less and less time to stop, stay focused, and reflect on whatever is in front of us. We have much less time to be in touch with our inner selves - our thoughts, feelings, consciousness, and how and why we have become the way we are, for better or worse. And our lives suffer because of it. Some of us find that it is too inconvenient and difficult to eat a whole apple. So major food outlets now sell “value-added” apples - pre-sliced apples, packed in bags and coated with an all-natural flavorless sealant so that they won't turn brown or lose their crispness for up to three weeks. These apples epitomize the new food-marketing concept of “snackability”: There are no crumbs and no fuss, nothing to interrupt the repetitive movement of hand to bag and food to mouth. Aside from the inherent lack of freshness and these “snackable” pre-cut apples, they also promote mindless eating– in the car, in front of the tv, at the computer, whenever and wherever. And while there are certainly much less healthy snack foods than precut apple slices, the pattern of eating is one we all experience and that food marketers promote with a vengeance. Most of the time, we are eating on autopilot, eating on the run, eating our worries or anxieties from the day's demands, anticipations, irritations, and quote to do on quote lists. 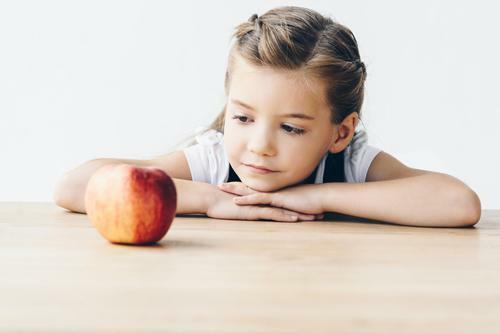 If we are not conscious of the food we eat, if we are not actively thinking about that apple, how can we taste it and get the pleasure of eating it? Eating an apple mindfully is not only a pleasant experience; it is good for health as well. The adage “an apple a day keeps the doctor away” is actually backed by solid science. Research shows that eating apples can prevent heart disease because the fiber and antioxidants they contain can prevent cholesterol buildup in the blood vessels of the heart. The fiber in apples can also help move waste to the intestines, which can help lower the risk of problems such as irritable bowel syndrome. Eating the apple with the skin - especially when it is organic– is better than eating it without the skin, as half of the vitamin C is under the apple skin; the skin itself is rich in phytochemicals, special plant compounds that made fight chronic disease. Apples are also packed with potassium, which can help keep blood pressure under control. Beyond the health benefits and pleasure and apple can provide, when we view the apple on an even grander scale we can see it as a representative of our cosmos. Look deeply at the apple in your hand and you will see the farmer who tended the apple tree; the blossom that became the fruit; the fertile earth, the organic material from decayed remains of prehistoric marine animals and algae, and the hydrocarbons themselves; the sunshine, the clouds, and the rain. Without the combination of these far-reaching elements and without the help of many people, the apple would simply not exist. At its most essential, the apple you hold is a manifestation of the wonderful presence of life. It is interconnected with all that is. It contains the whole universe; it is an ambassador of the cosmos coming to nourish our existence. It needs our body, and if we eat it mindfully, it also feeds our soul and recharges our spirit. Eating an apple consciously is to have a new awareness of the apple, of our world, and of our own life. It celebrates nature, honoring what Mother Earth and the cosmos have offered us... With this awareness and insight, you begin to have a greater feeling of gratitude for an appreciation of the food you eat, and your connection to nature and all others in our world. As the apple becomes more real and vibrant, your life becomes more real and vibrant. Savoring the apple is mindfulness at work. And it mindfulness that will help you reconnect with yourself and become healthier in mind, body, and spirit now and in the future.